You are an Atlanta Falcons fan! You spend hours per week on Falcons fans sites chatting or blogging in different forums. You somehow get through the week just yearning for Sunday to get here because your Atlanta Falcons have a Home game! 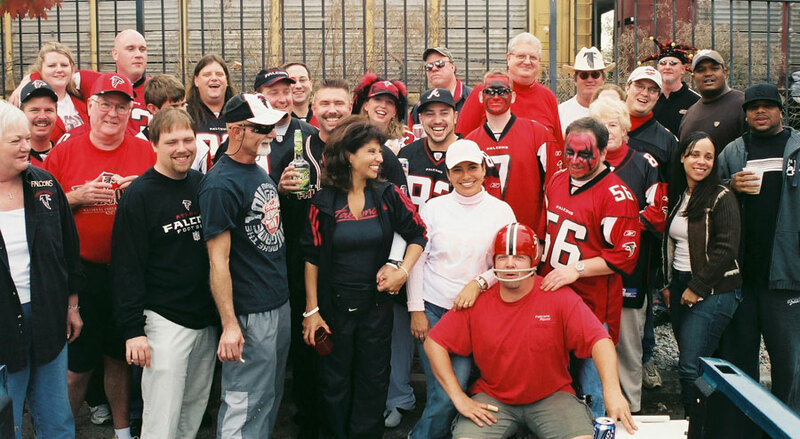 Make it an even better experience by attending a Falconsroost Tailgate! We have many new members here at Da' Roost and many have said they were going to attend a "Roost Tailgate" this coming season. I hope everyone gets a chance to come down and introduce themselves and put some faces to some names you've "chatted" w/ over the years. Ask just about ANY member here on Da' Roost about THEIR experience at the tailgates w/ us! You are guaranteed to have a good time, if not, then you can go see our "Complaint Dep't Mgr." Ms. Helen Waite. PLEASE GO TO HELLEN WAITE! Ahhhh Haa Haa Haa!! Seriously though, if you get a chance and you've never attended a Tailgate...Roost Style, please come on by! If you plan on attending a Chef Monkeee - Falconsroost Tailgate and you'd like to be included in the head-count for food, PLEASE click on the "Forums" tab in the Main Menu and then click on "Tailgate Forum" and look for the thread to the corresponding tailgate/game you will be attending and post how many of you want to be included in the food prep head count. 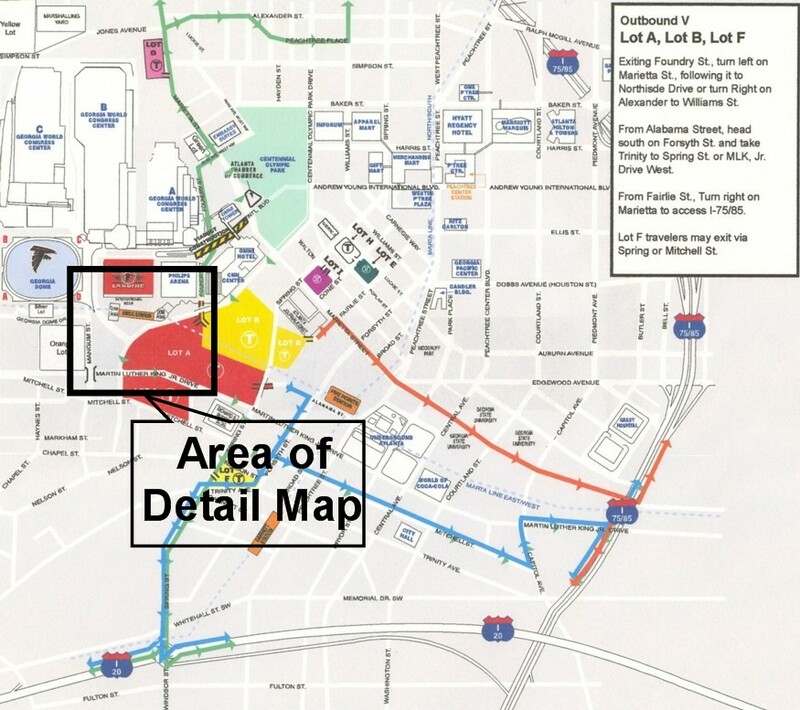 When you enter Lot A from (Marietta St.) turn Right and go until you hit an iron fence and port-a-potties, then turn LEFT. Go approx. 200ft. 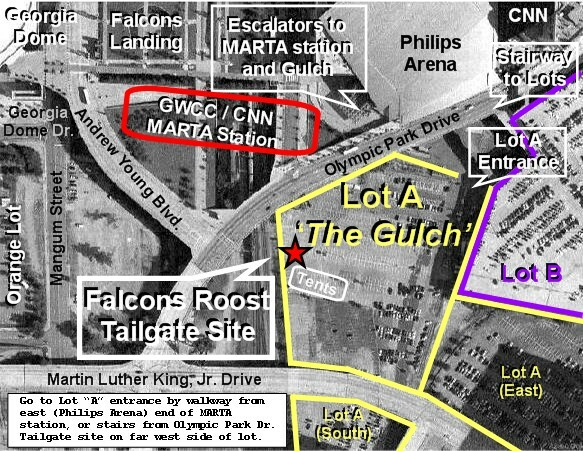 and look for a Falcons tent, a Red Ford F150 w/ a Falcons helmet (or 2) on top, the music pumping and the people having a good time! See you there!!! * * * Donations are VERY appreciated as I fund this myself. If you'll be attending a Chef Monkeee run Falconsroost Tailgate and would like to enjoy my cullinary skills AND you'd like to Pre-Pay, please use the safe & secure PayPal method by clicking the "Donate" (PayPal) button below.